Our captain watched with some consternation as an unidentified vessel, gray with no markings, headed straight toward our vessel, anchored more than 50 miles off Cuba’s southern coast. Others in the crew speculated nervously about the approaching boat, never previously seen in these parts. The boat pulled alongside and two imposing figures boarded, both in olive military uniforms. 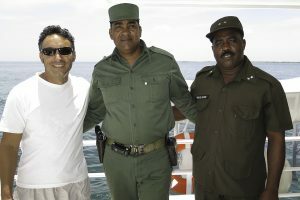 A mustachioed representative of the Ministry of Interior stood by his taller colleague whose uniform, like the boat that carried him, bore no markings at all. A sidearm hung imposingly from his belt. He turned to the captain and requested to meet with Bobby Kennedy, Jr.
At that moment, Bobby — a leading environmental activist, board president of Waterkeeper Alliance, and son of the late senator Robert F. “Bobby” Kennedy — was 90 feet below the surface with the rest of our group, observing a dozen or so Caribbean reef sharks tracing mesmerizing circles about us. We were carrying the flag of the Explorers Club, visiting and documenting previously unexplored coral reef ecosystems in Cuba’s southern waters.